These brackets only need to be ordered if this replacement cooling unit is being installed in a cabinet that is NOT a Le Cache unit. Some of the other manufacturers (Vinocraft, Wine Cellar Impressions, Vinotemp) who use Breezaire and for whom the CellarPro can serve as a replacement potentially don't have removable mounting brackets at the front of the cooling unit, so we offer the clips as a contingency. 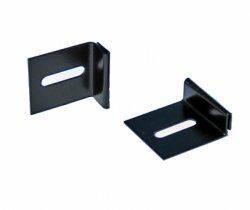 We can not guaranty that the brackets will work with your particular mounting as other cabinets will be different, but these brackets will work in most cases where a Breezaire or a Wine Mate were used previously.